Hayat (Birce Akalay) is a literature teacher at a top private school. She is so idealist that she cannot refrain from defending her own rights in every occasion. Due to this attitude, she does not have an easy life and often faces with different difficulties. Hayat lives together with her little sister Gozde (Simay Barlas) who goes to the same high school where Hayat teaches. After their parents’ death, Hayat becomes both a mother and a father for her sister and tries to do her best to protect her sister from dangers. Sometimes, she becomes so authoritarian and for this reason; she is exposed to criticism by her sister. Hayat’s job at a private high school makes it financially possible for her sister Gozde to attend the school as a student. They have a modest life whereas all the students at that private school have a wealthy life. Thus, Gozde sometimes finds it hard to keep pace with her classmates’ lifestyle. One day, Hayat gets an urgent phone call saying Gozde is in danger at a party. She arrives at the given address just in time to stop her unconscious sister from being raped by a fellow student Koray (Anil Tetik). Koray is Gozde’s boyfriend who is attending to the same high school and at the same time, is the brother of an ex mafia leader Cerrah (Kanbolat Gorkem Arslan). Efe is only 7 years old when he sees his mother Leyla (Senay Gurler) with another man. He hides in his father’s car with a fear that his mother and his father would end their marriage. While everybody is looking for him, his father gets in the car and finds out Efe in anxiety. Efe and his father find themselves in the middle of a big trap. In a car accident, Efe’s father is murdered and Efe becomes the only witness to the murder. The killers arrange for the little boy to meet the same fate as his father, but the hired assassin cannot go through with it and gives the child to his fisherman friend. Efe loses his memory; he forgets his name and family. He is separated from his identical twin brother, Mete. His real family believes that both Efe and his father have died in the car accident. In fact, Efe starts to live together with his adopted father Ismail (Mehmet Esen), mother Fatma (Gamze Suner Atay) and sister Nadide. His new life becomes a lot different than his previous life. Murat (Erdal Besikcioglu) is a professor of molecular biology who is trying to find a cure for his comatose sister Ezo (Ayca Eren). He feels guilty for the death of his father and for his sister’s illness. When Murat was a young man, he made a car accident and indirectly caused the death of his father. After this tragedy, his sister Ezo started to have a psychological problem and used sedatives. When Ezo increased the dosage of her pills without the permission of her doctor, she fell into a coma. Murat wants to do everything that could save his sister from a 5-year long coma. He just discovers a medicine and tries a new potion on himself first without getting required permissions. But this discovery changes his life in an unexpected way. 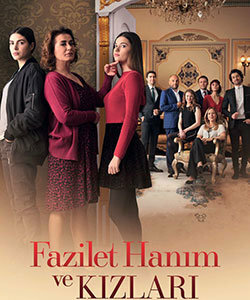 Little girl Elif (Isabella Damla Guvenilir) lives with his mother Melek (Selin Sezgin), stepfather Veysel (Hasan Balliktas), her step-sister Zeynep (Gulcin Tuncok) and step-brother Murat (Batuhan Soncul). Elif is almost 5 years old but she is much more mature than her peers. She is very helpful and at the same time, strong enough to endure her stepfather’s cruelty. Veysel is a hopeless, violent gambler who tortures not only Melek but also little Elif. He plans to sell Elif to pay back his gambling debts. Out of pure coincidence, Melek discovers his husband’s ill intention and finds out the passport on behalf of her daughter. In order to save her daughter, she eventually decides to call her long-lasting friend Ayse (Ozanay Alpkan) and asks for her assistance. Ayse is a servant in the house of the wealthy Emiroglu family where Melek used to work. When Ayse arrives at Melek’s house, she is so surprised to see her old friend in a desperate situation. She does not understand why Melek is married to this violent man but eventually, learns the secrets that were buried in the past.